For the visual phenomenon created on the Moon by lunar craters, see Lunar x. "landing a robot on the surface of the Moon, traveling 500 meters over the lunar surface, and sending images and data back to the Earth." 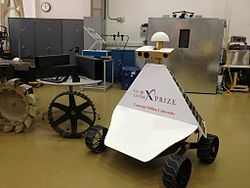 The Google Lunar XPRIZE (GLXP), sometimes referred to as Moon 2.0, was a 2007–2018 inducement prize space competition organized by the X Prize Foundation, and sponsored by Google. The challenge called for privately funded teams to be the first to land a robotic spacecraft on the Moon, travel 500 meters, and transmit back to Earth high-definition video and images. The original deadline was the end of 2014, with enhanced prize money for a landing by 2012. In 2015, XPRIZE announced that the competition deadline would be extended to December 2017 if at least one team could secure a verified launch contract by 31 December 2015. Two teams secured such a launch contract, and the deadline was extended. In August 2017, the deadline was extended again, to 31 March 2018. Entering 2018, five teams remained in the competition: SpaceIL, Moon Express, Synergy Moon, Team Indus, and Team Hakuto, having secured verified launch contracts with Spaceflight Industries, Rocket Lab, Interorbital Systems, and ISRO (jointly for the last two teams). On 23 January 2018, the X Prize Foundation announced that "no team would be able to make a launch attempt to reach the Moon by the [31 March 2018] deadline... and the US$30 million Google Lunar XPRIZE will go unclaimed." On 5 April 2018, the X Prize Foundation announced that the Lunar XPRIZE would continue as a non-cash competition. On 11 April 2019 the SpaceIL spacecraft crashed while attempting to land on the moon. The SpaceIL team was awarded a $1 million "Moonshot Award" by the X Prize Foundation in recognition of touching the surface of the moon. The Google Lunar XPRIZE was announced at the Wired Nextfest on 13 September 2007. The competition offered a total of US$30 million in prizes to the first privately funded teams to land a robot on the Moon that successfully travels more than 500 meters (1,640 ft) and transmits back high-definition images and video. The first team to do so would have claimed the US$20 million grand prize; while the second team to accomplish the same tasks would have been awarded a US$5 million second prize. Teams also earned additional money by completing additional tasks beyond the baseline requirements required to win the grand or second prize, such as traveling ten times the baseline requirements (greater than 5,000 meters (3 mi)), capturing images of the remains of Apollo program hardware or other man-made objects on the Moon, verifying from the lunar surface the recent detection of water ice on the Moon, or surviving a lunar night. Additionally, a US$1 million diversity award was to be given to teams that make significant strides in promoting ethnic diversity in STEM fields. To provide an added incentive for teams to complete their missions quickly, it was announced that the prize would decrease from US$20 million to US$15 million whenever a government-led mission lands on and explores the lunar surface. However, in November 2013, the organizers and the teams agreed to drop this rule, as the launch of the Chinese Chang'e 3 probe—which landed on the Moon in December 2013—approached. In 2015, XPRIZE announced that the competition deadline would be extended to December 2017 if at least one team could secure a verified launch contract by 31 December 2015. Two teams secured such a launch contract, and the deadline was extended. XPRIZE announced 5 finalists on 24 January 2017. SpaceIL, Moon Express, Synergy Moon, Team Indus, and Hakuto having secured verified launch contracts for 2017 (with SpaceX, Rocket Lab, Interorbital Systems and ISRO respectively). All other teams had until the end of 2016 to secure a verified launch contract, but failed to meet this deadline. The Google Lunar XPRIZE expired on 31 March 2018 as none of the five final teams were able to launch their vehicles by the deadline. Another extension of the deadline was ruled out by Google, and the prize went unclaimed. The goal of the Google Lunar X Prize was similar to that of the Ansari X Prize: to inspire a new generation of private investment in hopes of developing more cost-effective technologies and materials to overcome many limitations of space exploration that are currently taken for granted. The Google Lunar XPRIZE was announced in 2007. Similar to the way in which the Ansari XPRIZE was formed, the Google Lunar XPRIZE was created out of a former venture of Peter Diamandis to achieve a similar goal. Dr Diamandis served as CEO of BlastOff! Corporation, a commercial initiative to land a robotic spacecraft on the Moon as a mix of entertainment, internet, and space. Although it was ultimately unsuccessful, the BlastOff! initiative paved the way for the Google Lunar X Prize. Initially, NASA was the planned sponsor and the prize purse was just US$20 million. As NASA is a federal agency of the United States government, and thus funded by US tax money, the prize would only have been available to teams from the United States. The original intention was to propose the idea to other national space agencies, including the European Space Agency and the Japanese space agency, in the hope that they would offer similar prize purses. The prize was originally announced in 2007 as "a contest to put a robotic rover on the Moon by 2012," with a $20 million prize to the winner if the landing was achieved by 2012; the prize decreased to $15M until the end of 2014, at which point the contest would conclude. The five-year deadline was optimistic about schedule. Jeff Foust commented in Space Review that as the end of 2012 approached, "no team appeared that close to mounting a reasonable bid to win it." In 2010, the deadline was extended by one year, with the prize to expire at the end of December 2015, and the reduction of the grand prize from $20 million to $15 million changed from originally 2012 to "if a government mission successfully lands on the lunar surface." On 16 December 2014, XPRIZE announced another extension in the prize deadline from 31 December 2015 to 31 December 2016. In May 2015, the foundation announced another extension of the deadline. The deadline for winning the prize was now December 2017, but contingent on at least one team showing by 31 December 2015 that they have a secured contract for launch. On 9 October 2015, team SpaceIL announced their officially verified launch contract with SpaceX, therefore extending the competition until the end of 2017. On 16 August 2017, the deadline was extended again, to 31 March 2018. None of the remaining teams were be able to claim the Google X-Prize money due to the inability to launch before the final deadline. Some observers have raised objections to the inclusion of the two "Heritage Bonus Prizes," particularly the Apollo Heritage Bonus Prize, which was to award an additional estimated US$1 million to the first group that successfully delivers images and videos of the landing site of one of the Apollo Program landing sites, such as Tranquility Base, after landing on the lunar surface. Such sites are widely regarded as archaeologically and culturally significant, and some have expressed concern that a team attempting to win this heritage bonus might inadvertently damage or destroy such a site, either during the landing phase of the mission, or by piloting a rover around the site. As a result, some archaeologists went on record calling for the Foundation to cancel the heritage bonus and to ban groups from targeting landing zones within 100 kilometers (62 mi) of previous sites. In turn, the Foundation noted that, as part of the competition's educational goals, these bonuses fostered debate about how to respectfully visit previous lunar landing sites, but that it does not see itself as the appropriate adjudicator of such an internationally relevant and interdisciplinary issue. This response left detractors unsatisfied. The Foundation pointed to the historical precedent set by the Apollo 12 mission, which landed nearby the previous Surveyor 3 robotic probe. Pete Conrad and Alan Bean approached and inspected Surveyor 3 and even removed some parts from it to be returned to Earth for study; new scientific results from that heritage visit, on the exposure of manmade objects to conditions in outer space, were still being published in leading papers nearly four decades later. However, as Surveyor 3 and Apollo 12 were both NASA missions, there was no controversy at the time. In January 2011, NASA's manager for lunar commercial space noted on Twitter that work was underway to provide insight and guidelines on how lunar heritage sites could be protected while still allowing visitations that could yield critical science. And in July 2011, NASA issued Recommendations to Space-Faring Entities: How to Protect and Preserve the Historic and Scientific Value of U.S. Government Lunar Artifacts. These guidelines were developed with the assistance of Beth O'Leary, an anthropology professor at New Mexico State University in Las Cruces, and a recognized leader in the emerging field of space archaeology. However, these are only guidelines and recommendations and are not enforceable beyond the possibility of "moral sanctions." An organization called For All Moonkind, Inc. is now working to develop an international treaty that will include enforceable provisions designed to manage access to the Apollo sites and protect and preserve those sites, as well as others on the Moon, as the common heritage of all humankind. Nevertheless, some of the Apollo astronauts themselves have expressed support for the bonus, with Apollo 11 Moonwalker Buzz Aldrin appearing at the Google Lunar XPRIZE's initial announcement and reading a plaque signed by the majority of his fellow surviving Apollo Astronauts. On 23 January 2018, the X Prize Foundation announced that "no team would be able to make a launch attempt to reach the Moon by the [31 March 2018] deadline... and the US$30 million Google Lunar XPRIZE will go unclaimed." On 11 April 2019, the foundation awarded a US$ 1 million dollar award to SpaceIL after its craft Beresheet crashed on the moon. Registration in the Google Lunar X Prize closed by 31 December 2010. The complete roster of 32 teams was announced in February 2011. By January 2017, there were just five officially registered Google Lunar X Prize teams continuing to pursue the prize objectives, as other teams had left the competition entirely, failed to achieve a competition interim milestone, or merged with other teams: Initially 32 teams were registered, with 16 teams having actively participated in all activities and only 5 teams satisfying the rule requiring a verified launch contract by 31 December 2016. Shortly after the announcement of the complete roster of teams, an X Prize Foundation official noted that a total of thirty one teams entered a partial registration program by filing a "Letter of Intent" to compete; of these, twenty did indeed register or join other registered teams, while eleven ultimately did not register. $1 million (for up to 3 teams) for the Lander System Milestone Prize to demonstrate hardware and software that enables a soft-landing on the Moon. $500,000 (for up to 4 teams) for the Mobility Subsystem Milestone Prize to demonstrate a mobility system that allows the craft to move 500 meters after landing. $250,000 (for up to 4 teams) for the Imaging Subsystem Milestone Prize for producing "Mooncasts" consisting of high-quality images and video on the lunar surface. The five selected teams were required to accomplish the milestones outlined in their submissions through testing and mission simulations, in order to be awarded the interim prizes. The teams had until October 2014 to complete the prize requirements. The winners were officially awarded on 26 January 2015 in San Francisco. Teams were required to have verified launch contracts by the end of 2016 in order to remain in the competition. Although the contest ended without a winner, some of these teams have expressed an intention to launch in the future. SpaceIL February 22, 2019 SpaceX Falcon 9 On February 22, 2019, SpaceIL and the government-owned Israel Aerospace Industries successfully launched the Beresheet lander on a SpaceX Falcon 9 rocket provided by Spaceflight Industries. The spacecraft entered lunar orbit on April 4, but its landing attempt on April 11 failed. Hakuto / ispace 2020 (planned) SpaceX Falcon 9 Hakuto was to have been a piggyback on TeamIndus's canceled PSLV flight. In September 2018, Hakuto's parent company ispace announced a launch planned for 2020. Moon Express Rocket Lab Electron Moon Express's launch contract was with Rocket Lab. Synergy Moon Interorbital Systems Neptune The Synergy Moon team partnered with Interorbital Systems for their launch vehicle and launch process. TeamIndus PSLV-XL Team Indus's launch contract was with Antrix Corporation, the commercial arm of ISRO. The contract was cancelled in early 2018. Three competitors who were unable to get a verified launch contract by 31 December 2016, disqualifying them from the competition, are also still planning to launch their crafts independently. PTScientists 2020 SpaceX Falcon 9 The proposed landing site is in the Taurus-Littrow valley, about two miles from the site of the final Apollo 17 mission. The lander's name is ALINA, and it carries 2 small Audi rovers. Astrobotic early 2021 ULA Atlas V Lander is called "Peregrine". Team AngelicvM early 2021 ULA Atlas V with Astrobotic Team AngelicvM signed a contract with Astrobotic in 2015 to have their rover carried on board Astrobotic's lander. This arrangement is still in effect as of 2018. Wikimedia Commons has media related to Google Lunar X Prize. ^ a b "About the Google Lunar XPRIZE". Retrieved 3 December 2011. ^ a b Koman, Richard (14 September 2007). "Moon 2.0: Google Funds $30 Million Lunar X Prize". Newsfactor. Archived from the original on 16 May 2011. Retrieved 22 September 2007. ^ "Overview". Google Lunar XPRIZE. Archived from the original on 3 March 2016. Retrieved 18 February 2016. ^ a b "Deadline For $30 Million Google Lunar XPRIZE Extended To End of 2017". Google Lunar XPRIZE. Retrieved 18 February 2016. ^ a b c d e "Israeli Google Lunar XPRIZE Team Is First to Sign Launch Agreement For Private Mission to the Moon on SpaceX Falcon 9". Google Lunar XPRIZE. Retrieved 18 February 2016. ^ a b Wall, Mike (16 August 2017). "Deadline for Google Lunar X Prize Moon Race Extended Through March 2018". space.com. Retrieved 19 September 2017. ^ TheMarker (2017). "Israel's SpaceIL One of Five Finalists in Global Race to the Moon". Haaretz. Retrieved 12 September 2017. ^ Wattles, Jackie. "Meet the 5 finalists in the Google XPrize moonshot". CNNMoney. Retrieved 12 September 2017. ^ a b "XPRIZE Verifies Moon Express Launch Contract, Kicking Off New Space Race". Google Lunar XPRIZE. Retrieved 18 February 2016. ^ a b c d "SYNERGY MOON Team Member Interorbital Systems to Serve as Launch Provider". Google Lunar XPRIZE. 30 August 2016. Retrieved 8 September 2016. ^ a b c Foust, Jeff (23 January 2018). "Google Lunar X Prize to end without winner". SpaceNews. Retrieved 24 January 2018. The foundation running the Google Lunar X Prize announced Jan. 23 that the $20 million grand prize for a commercial lunar lander will expire at the end of March without a winner. The X Prize Foundation said none of its five finalist teams would be able to launch a mission before the current deadline of March 31. That deadline has been extended several times in the past, but foundation officials previously said there would be no further extensions of the competition. ^ Potenza, Alessanda (5 April 2018). "X Prize relaunches its Moon competition, but without a cash prize". Retrieved 15 April 2018. ^ a b c Mike, Wall (11 April 2019). "Israel's Beresheet Spacecraft Crashes Into Moon During Landing Attempt". Space.com. Retrieved 11 April 2019. ^ Reiss, Spencer (13 September 2007). "Google Offers $20 Million X Prize to Put Robot on Moon". 15 (10). Wired. Retrieved 16 September 2007. ^ "Guidelines". Google Lunar XPRIZE. Retrieved 18 February 2016. ^ "A New Player in the Return to the Moon". Google Lunar XPRIZE. 13 November 2013. ^ a b c d e f "Meet The 5 Teams That Are Launching To The Moon This Year". Google Lunar XPRIZE. 24 January 2017. Retrieved 24 January 2017. ^ "FAQ". Google Lunar XPRIZE. Retrieved 18 February 2016. ^ Sheetz, Michael (22 January 2018). "Google's $20 million race to the moon will end with no winner — and Google is OK with that". CNBC. Retrieved 23 January 2018. ^ "Ex-Prize: Google's $30 Million Moon Race Ends with No Winner". Space.com. Retrieved 23 January 2018. ^ "A Word From the Founders of X Prize & Google". Retrieved 16 September 2007. ^ Laursen, Lucas (5 June 2014). "Google Lunar Race Teams Discuss Next Steps, House on the Moon". IEEE Spectrum. Retrieved 12 June 2014. ^ "Origin of the prize". X Prize Foundation. Retrieved 23 February 2008. ^ a b "Is it true that originally the Google Lunar X Prize was going to be the NASA Lunar X Prize (or the ESA or similar)?". X Prize Foundation. Retrieved 19 February 2011. ^ a b "Deadline For $30 Million Google Lunar XPRIZE Extended To End of 2016". lunar.xprize.org. 16 December 2014. ^ Thomas, Jill; Walsh, Justin St P. (1 June 2009). "Space archaeology" – via LA Times. ^ Billings, Lee (28 October 2008). "Billings, Lee, "Should the Sites of Lunar Landings Be Protected as PArt of our Cultural Inheritance?"". SEED. Retrieved 19 February 2011. ^ Matson, John (9 June 2009). "Matson, John, "Can space-faring companies be entrusted with the Apollo program's history?," Scientific American, "60-Second Science," Comments, 9 June 2009". Scientificamerican.com. Retrieved 15 December 2010. ^ "Apollo Relic Reveals its Secrets". NASA. 20 June 2008. Retrieved 19 February 2011. ^ "Twitter / @Rob Kelso – Great meeting yesterday at ..." NASA. 20 January 2011. Retrieved 19 February 2011. ^ NASA (28 October 2011) [First published 20 July 2011]. "Recommendations to Space-Faring Entities: How to Protect and Preserve the Historic and Scientific Value of U.S. Government Lunar Artifacts" (PDF). Retrieved 11 December 2017. ^ "NASA Sets Guidelines to Preserve Apollo Moon Landing Sites". ^ Chang, Kenneth (23 January 2018). "A Push for Historic Preservation on the Moon" – via NYTimes.com. ^ "For All Moonkind - Preserving Our First Off World Footsteps". forallmoonkind.org. ^ "Buzz Aldrin at the Google Lunar X PRIZE Launch". X PRIZE Foundation. 22 July 2009. Retrieved 19 February 2011. ^ "Meet The 5 Teams That Are Launching To The Moon This Year". 24 January 2017. ^ "MoonEx aims to scour Moon for rare materials". Los Angeles Times. 8 April 2011. Retrieved 10 April 2011. ^ a b "SYNERGY MOON". www.synergymoon.com. Retrieved 10 May 2018. ^ "Watch The Google Lunar XPRIZE "Moon Shot" Documentary". ^ a b "Team Indus, Japan's Hakuto combine for Moon mission". The Times of India. 22 December 2016. Retrieved 18 September 2017. ^ Isro-TeamIndus deal falls apart, Japanese moon mission delayed. Srinivas Laxman, The Times of India. 15 January 2018. ^ Google Lunar Xprize: ISRO Calls Off Contract With TeamIndus. ^ a b Barton, Andrew (1 December 2009). "Mission Concept". White Label Space. Retrieved 15 December 2010. ^ Japanese team competing in lunar probe contest to delay launch. Japan Times. 8 November 2018. ^ "About Team Indus | X PRIZE Foundation". Googlelunarxprize.org. Retrieved 17 February 2011. ^ "Indian space start-up's lunar dream gets ISRO support; aims for global prize!". Zee News. 31 October 2016. Retrieved 31 October 2016. ^ "SpaceIL and Odyssey Moon Announce Joint Teaming Agreement". Googlelunarxprize.org. 20 November 2012. Retrieved 23 November 2012. ^ "Odyssey Moon – About Us | X PRIZE Foundation". Googlelunarxprize.org. 15 August 2007. Retrieved 15 December 2010. ^ "Two Google Lunar XPRIZE Teams Announce Rideshare Partnership For Mission to the Moon in 2016". xprize.org. Xprize Foundation. 23 February 2015. Retrieved 6 March 2015. Hakuto [... and fellow competitor] Astrobotic [will] carry a pair of rovers to the Moon. Astrobotic plans to launch its Google Lunar XPRIZE mission on a SpaceX Falcon 9 rocket from Cape Canaveral, Fla., during the second half of 2016. HAKUTO's twin rovers, Moonraker and Tetris, will piggyback on Astrobotic's Griffin lander to reach the lunar surface. Upon touchdown, the rovers will be released simultaneously ... in pursuit of the $20M Google Lunar XPRIZE Grand Prize. ^ "Lander". Archived from the original on 31 May 2012. Retrieved 28 May 2012. ^ "Astrobotic Pulls Out of Google Lunar X Prize – Parabolic Arc". www.parabolicarc.com. ^ "Astrobotic – About Us | X PRIZE Foundation". Googlelunarxprize.org. 15 August 2007. Retrieved 23 November 2012. ^ "SpaceX Lands Contract To Fly To Moon". Aviation Week. 8 February 2011. Retrieved 8 February 2011. The landing site, originally targeted for the Sea of Tranquility near where Apollo 11 touched down, is up for grabs, as is the name of the spacecraft, once called Artemis, and the name and destinations of the 1.5-meter tall, 1-meter wide rover. ^ "Team Italia – About Us | X PRIZE Foundation". Googlelunarxprize.org. 15 August 2007. Retrieved 15 December 2010. ^ "Moon Express, Inc. Announces Acquisition of Next Giant Leap, LLC". Archived from the original on 6 October 2014. ^ "Next Giant Leap – About Us | X PRIZE Foundation". Googlelunarxprize.org. Retrieved 15 December 2010. ^ "FredNet – About Us | X PRIZE Foundation". Googlelunarxprize.org. 15 August 2007. Retrieved 15 December 2010. ^ a b "ARCA – About Us | X PRIZE Foundation". Googlelunarxprize.org. Retrieved 15 December 2010. ^ a b c d "SYNERGY SPACE EXPLORERS". Google Lunar X Prize. 24 December 2016. Retrieved 12 January 2017. ^ "STELLAR – About Us | X PRIZE Foundation". Googlelunarxprize.org. 15 August 2007. Retrieved 15 December 2010. ^ "JURBAN – About Us | X PRIZE Foundation". Googlelunarxprize.org. 15 August 2007. Retrieved 15 December 2010. ^ "Independence-X Aerospace – About Us | X PRIZE Foundation". Googlelunarxprize.org. 15 August 2007. Retrieved 15 December 2010. ^ a b "Omega Envoy – About Us | X PRIZE Foundation". Googlelunarxprize.org. 15 August 2007. Retrieved 15 December 2010. ^ "Euroluna – About Us | X PRIZE Foundation". Googlelunarxprize.org. 15 August 2007. Retrieved 15 December 2010. ^ "SELENE – About Us | X PRIZE Foundation". Googlelunarxprize.org. 15 August 2007. Retrieved 15 December 2010. ^ "Part-Time-Scientists – About Us | X PRIZE Foundation". Googlelunarxprize.org. 15 August 2007. Retrieved 15 December 2010. ^ Messier, Doug. "Team Drops Out of Google Lunar X Prize at Parabolic Arc". ^ a b "C-Base Open Moon – About Us | X PRIZE Foundation". Googlelunarxprize.org. 15 August 2007. Retrieved 15 December 2010. ^ "Selenokhod – About Us | X PRIZE Foundation". Googlelunarxprize.org. 15 August 2007. Retrieved 15 December 2010. ^ "Mystical Moon – About Us | X PRIZE Foundation". Googlelunarxprize.org. 17 February 2011. Retrieved 19 December 2010. ^ "Moon Express acquires Rocket City Space Pioneers in Teaming Agreement with Dynetics for pursuit of the $30 Million Google Lunar X PRIZE". Archived from the original on 6 February 2015. ^ "Rocket City Space Pioneers – About Us | X PRIZE Foundation". Googlelunarxprize.org. 15 August 2007. Retrieved 15 December 2010. ^ "Team Puli – About Us | X PRIZE Foundation". Googlelunarxprize.org. Retrieved 17 February 2011. ^ "SPACEMETA – About Us | X PRIZE Foundation". Googlelunarxprize.org. Retrieved 17 February 2011. ^ "Plan B – About Us | X PRIZE Foundation". Googlelunarxprize.org. Retrieved 17 February 2011. ^ Lindell, Rebecca (10 March 2011). "Rocket enthusiasts shoot for the Moon". Vancouver Sun. Archived from the original on 12 March 2011. Retrieved 10 March 2011. ^ "Penn State Lunar Lion Team – About Us | X PRIZE Foundation". Googlelunarxprize.org. Retrieved 17 February 2011. ^ Coli, Michael (19 March 2018). "Astrobiotic Ready to Become Delivery Service to the Moon". Spaceflight Insider. Retrieved 27 July 2018. ^ "Angelicum – About Us | X PRIZE Foundation". Googlelunarxprize.org. Retrieved 17 February 2011. ^ "Team Phoenicia – About Us | X PRIZE Foundation". Googlelunarxprize.org. Retrieved 17 February 2011. ^ "Southern California Selene Group (SCSG) – About Us | X PRIZE Foundation". Googlelunarxprize.org. 15 August 2007. Retrieved 15 December 2010. ^ Lunar challenge lures maverick, Denver Post, 2006-10-16, accessed 24 December 2010. Micro-Space plans circa 2006. ^ Micro-Space, Google Lunar X Prize webpage, 2010–11, accessed 24 December 2010. Noted that "Micro-Space withdrew from competition in November 2010." following the death of the founder, Richard P. Speck. ^ "Micro-Space – About Us | X PRIZE Foundation". Googlelunarxprize.org. 15 August 2007. Retrieved 15 December 2010. ^ "Quantum3 – About Us | X PRIZE Foundation". Googlelunarxprize.org. 15 August 2007. Retrieved 15 December 2010. ^ "Advaeros – About Us | X PRIZE Foundation". Googlelunarxprize.org. 15 August 2007. Retrieved 15 December 2010. ^ "The Launch Pad: Well, let's start: How many LOI teams were there?". X PRIZE Foundation. Retrieved 19 February 2011. ^ "Regulations – Milestone Prizes". Google Lunar X-Prize. ^ "Google Lunar XPRIZE Selects Five Teams to Compete for $6 Million in Milestone Prizes". googlelunarxprize.org. 19 February 2014. ^ a b c d e "Private Moon Race Heats Up As Five Google Lunar XPRIZE Teams Take Home $5.25 Million For Key Technological Advancements". lunar.xprize.org. 26 January 2015. ^ David, Leonard (11 July 2018). "Israel Aims to Launch Moon Lander in December". Space.com. Retrieved 25 July 2018. ^ Chang,, Kenneth (21 February 2019). "After SpaceX Launch, Israeli Spacecraft Begins Journey to the Moon". Retrieved 22 February 2019. ^ Wall, Mike (25 February 2019). "Israeli Moon Lander Fires Engine in Space for 1st Time". space.com. Retrieved 25 February 2019. ^ Grush, Loren (4 April 2019). "An Israeli lander is now orbiting the Moon ahead of a lunar landing next week". The Verge. Retrieved 4 April 2019. ^ a b Suprita Anupam (9 January 2018). "Google Lunar Xprize: ISRO Calls Off Contract With TeamIndus". Inc42. Retrieved 20 January 2018. ^ Grush, Loren. "Japanese company ispace says it will launch two missions to the Moon in 2020 and 2021". The Verge. Retrieved 28 September 2018. ^ Foust, Jeff (8 December 2015). "X Prize Verifies Moon Express Launch Contract". Space News. Space News. Retrieved 29 June 2017. ^ Alnoor Peermohamed & Raghu Krishnan (2 November 2016). "Team Indus gets slot on PSLV rocket for its journey to moon". Business Standard. Retrieved 4 November 2016. ^ Foust, Jeff (6 November 2018). "Former Google Lunar X Prize teams still working on lunar landers". SpaceNews. Retrieved 8 November 2018. ^ Foust, Jeff (22 January 2019). "ArianeGroup and PTScientists to study lunar lander mission for ESA". SpaceNews. Retrieved 25 January 2019. ^ a b Coli, Michael (19 March 2018). "Astrobiotic Ready to Become Delivery Service to the Moon". Spaceflight Insider. Retrieved 27 July 2018. ^ "Astrobotic teams with Airbus for ESA Moon mission". SpaceFlight Insider. 27 February 2019. Retrieved 28 February 2019. ^ "Team Angelicvm Will Fly with Astrobotic on First Lunar Mission" (Press release). Astrobotic. 27 October 2015. Retrieved 27 January 2018. ^ Keane, Phillip (18 July 2018). "Updates on GLXP teams from Israel, India and Japan". SpaceTech Asia. Retrieved 19 December 2018. This page was last edited on 14 April 2019, at 23:32 (UTC).